Collectively, Mozart�s flute quartets have a rather uncertain history, the "a" and "b" in the Köchel numbers giving the game away. Only K285 itself can be dated with certainty � it was finished on Christmas Day 1777 in response to a commission from a surgeon and dilettante musician. K298 probably dates from nine years later and should therefore have a much higher K number. Does any of that matter? Just put the disc on and the answer has to be no for here is Mozart at his most sparkling. There is a little pathos but only in the adagio of K285. Each quartet is quite different but the prevailing mood is sunny, probably reflecting the composer�s perspective on the instrument. Mozart varied the structure considerably - the D major has three orthodox movements whereas the A major opens with a theme and five variations to be followed by a minuet and rondo. The G and C major works are in two movements with the former being slighter and concluding with a minuet. Within these frameworks they all have in common a continuous stream of attractive melodies. Beethoven�s rarely heard Serenade dates from a time when his chamber music was quite experimental with combinations of instruments. It is in six movements with the second being a minuet and the fourth a set of variations. There is little darkness here either and the work is a perfect partner for the Mozart quartets. 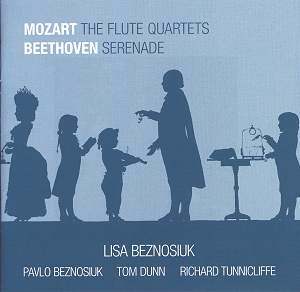 This recording uses period instruments, Lisa Beznosiuk�s four-keyed ebony flute dating from the time of Beethoven�s Serenade. There is tonal beauty and refinement on offer, and not only from the flautist. Ensemble is always on the money and the very clear recording strikes a beautiful balance between the instruments. The overall balance is just a shade close but I would be struggling to make other criticisms of this well-presented disc. Comparisons with Andreas Blau and the Amadeus Quartet in Mozart recordings made on modern instruments in 1978 are clearly favourable to the present issue which benefits from a more genial approach and notably more relaxed tempi in the outer movements of K285. In the other works Blau and the Amadeus tended to be slower and sound rather matter of fact. Delectable � if you want to forget the cares of the 21st century for an hour or so, this may be the answer.